Memoria Press is beginning to be a household name around here. We have gotten the chance to review for them a couple of times before and this time we are trying out one of their cursive handwriting books, New American Cursive 2 (Scripture). 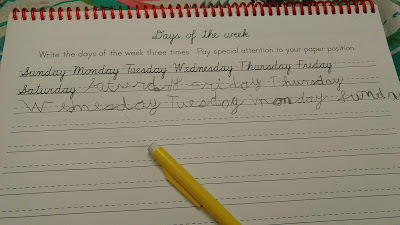 Most people have a love or hate type of a relationship when it comes to cursive handwriting, but we have really embraced it. 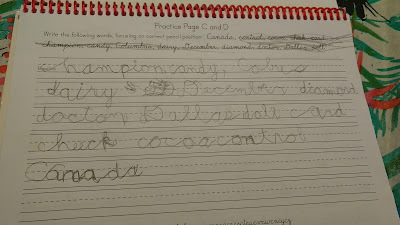 Even though J gets tires of it easily (he struggles with tensing up when he tries really hard), he is terribly proud of himself when he writes in cursive. Either way, it is nice to find high quality curriculum to rely on if/when your students pursue it. 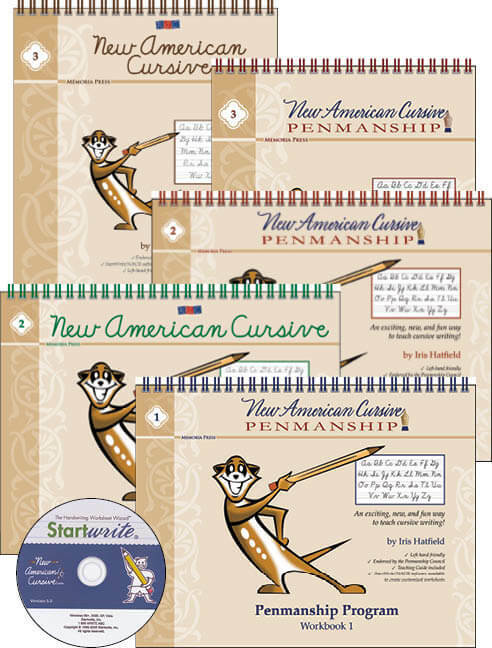 Memoria offers a complete New American Cursive penmanship program for Grade Levels 1-4 and we were given Workbook 2 with Famous Quotations and Scripture. The book itself is spiral bound at the top so that left or right-handed students can successfully utilize it equally. Workbook 2 begins with a 7 paged Teaching Guide that covers everything surrounding learning to write in cursive. 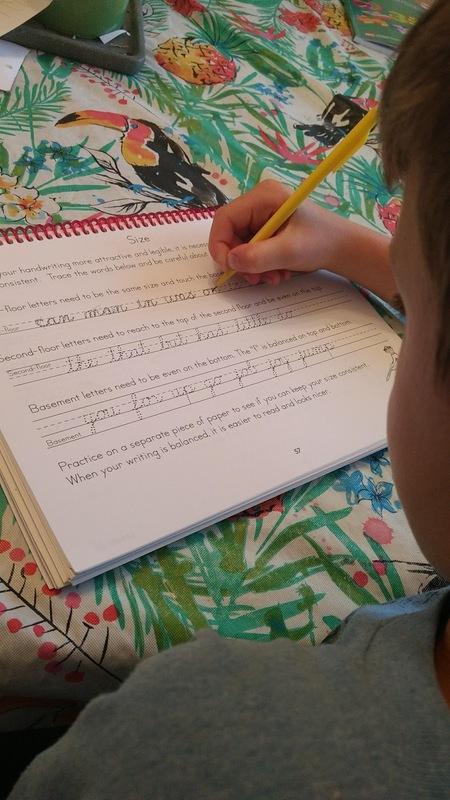 They discuss the value of learning cursive, posture and pencil position, testing, how to use the workbook, complementary exercises, and even the best type of music for handwriting practice! 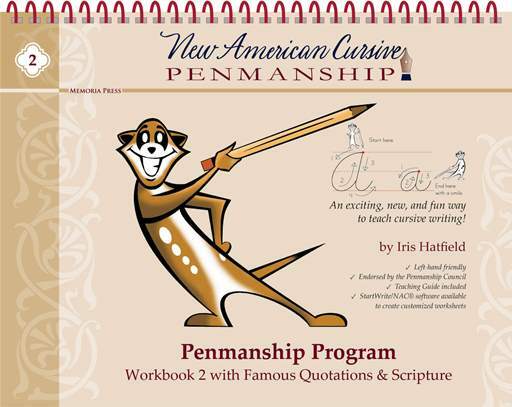 If you don't have a clue about penmanship or teaching it, this teaching guide gives you more than enough to equip you. Since this is Workbook 2 in a series, it begins with a review of the entire alphabet in cursive, pencil grip, posture and correct paper placement. 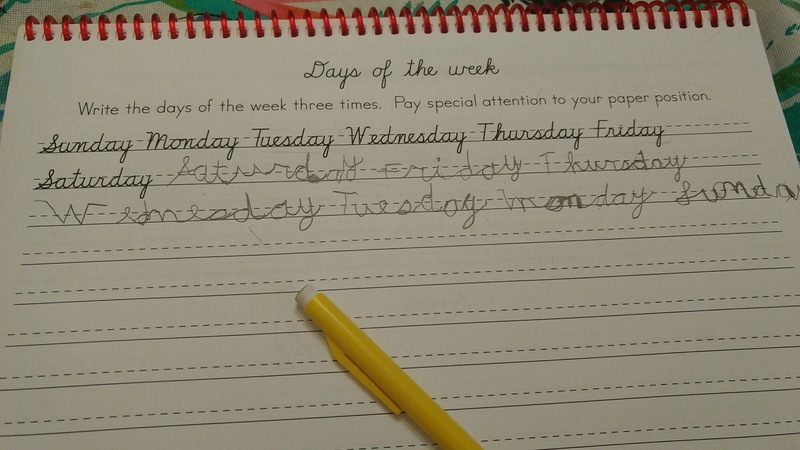 The next section highlights the individual letters, two to a page, along with practice words to trace and copy. Every few pages there is a fun or open-ended page perhaps with a writing prompt and encouraging the student to illustrate their response. 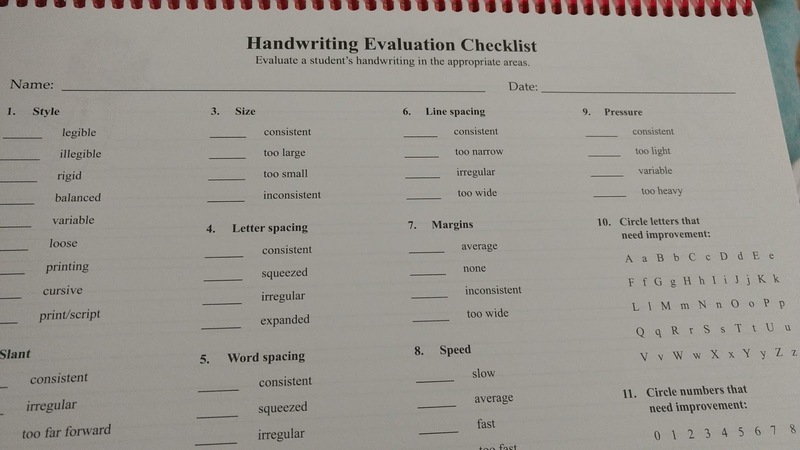 The next section focuses on the size of their writing, encouraging the correct placement of letters on baseline. Here several creative writing, scripture and quotations exercises are introduced. Near the end of the book there is a Handwriting Evaluation Checklist that helps you determine what your student needs to work on. It would be a handy page to reproduce whenever you need to check on their progress. 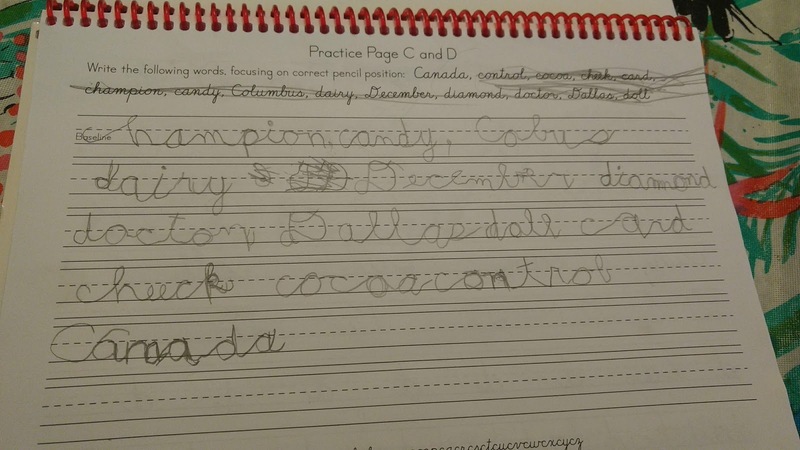 Since J is not brand new to cursive, this level was great for him. The review reminded him of what was expected out of his handwriting and inched him a little further in refining some of his letters. The variety of exercises was perfect! 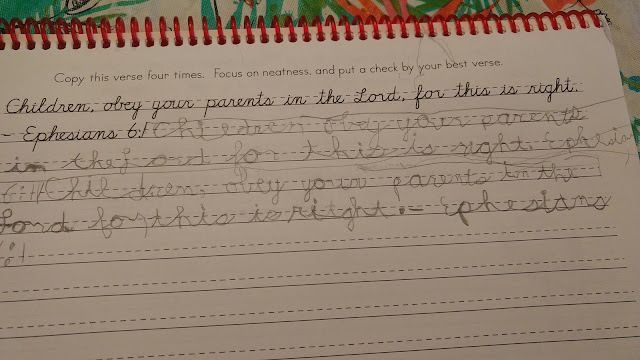 From days of the week, relevant scriptures like obeying your parents and being kind, to the incorporation of journal writing and drawing, there was always something new to distract from the usual weariness of handwriting. This is a great resource for strengthening handwriting skills that have already begun, but it is even more useful for building that bond of pencil and paper with journaling, something I strongly believe in. This program shows a lot of wisdom and forethought for various learning styles as well. We highly recommend Memoria Press and Workbook 2 with Famous Quotations and Scripture. is worked very well for our needs. The Crew reviewed other books in the penmanship series as well as Traditional Logic and Classical Composition. Don't forget to check out what they thought about the rest of the products. What Kind of Acorn Am I?